At the same time, as funny and smart and sometimes subversive as Brooklyn Nine-Nine is, there are still those times when it reminds the audience that, as a network sitcom, it remains at the whims of a network’s approach to sitcoms and certain sitcom decisions. Here, that means having a Thanksgiving episode, simply because it’s Thanksgiving time. So “Mr. Santiago” hits that mandatory holiday episode designation hard this week, complete with wild, live turkey and disapproving father shenanigans. Unsurprisingly, the Brooklyn Nine-Nine cast (and guest stars Jimmy Smits and Jason Mantzoukas) is more than up for the “challenge” of hitting all of these episode’s somewhat tired beats, but even with its brief moments of zagging where the episode would typically zig, “Mr. Santiago” isn’t an especially hilarious or out there episode of Brooklyn Nine-Nine. “Mr. Santiago” starts off strongly, with the Captain Holt impression-off cold open, even though it too ends with the predictable revelation that Boyle gets another win in his own seemingly incorrect Holt impression (though Terry does the actual best standard Holt impression). And Jake’s decision to go “full Santiago” with a binder of information on Mr. Santiago (Smits) sets the episode up for something fun… only to lead to the typical sitcom reveal of Santiago both finding the binder (titled “Jake Peralta’s Guide To Tricking Amy’s Dad”) and disapproving of Jake and Amy’s relationship. At the same time, it’s important to note that Amy and Jake’s relationship has been one of the understated bright spots of Brooklyn Nine-Nine, which is especially impressive because they really make no sense on paper. In fact, even before Amy’s father points that out, Jake as a human being has never really made sense on paper. (Honestly, I will never stop worrying about him when it comes to the most basic functions, even though he somehow continues to be the most “woke” character on the show.) So of course an “informed” Mr. Santiago doesn’t approve of Jake: Besides the fact that he’s an NYPD detective (which isn’t exactly an easy task, in terms of reality), nothing about Jake from an outsider’s perspective is glowing. One could say he’s an acquired taste, and this certainly episode does. And since there’s not exactly time for Mr. Santiago to acquire that taste, the episode is actually quite smart to address the very true fact that Amy’s love of Jake is the only thing that matters in this case. But at least it’s fun to see the Lion and the Barracuda work a case together. Because that’s a team-up for the ages, even if it’s the most no stakes case there could be. Then there’s the main Thanksgiving-based plot of the show, which is obvious from the moment the characters announce that Boyle is in charge of the turkey. This is the rare occasion that Boyle’s “weird” food decisions simply don’t work, because there’s no way the live turkey reveal isn’t coming. And really, it reads as a poor decision on everyone else’s part for both putting Boyle in charge of major Thanksgiving food duty and not even thinking to tell him (in advance) not to go with a live turkey. Because let’s be real: Of course Boyle gets a live turkey. Of course there’s a moral dilemma about said live turkey. And of course they all learn a lesson about how turkeys are the monsters of the bird world. It’s the most by-the-numbers plot of the episode, right down to Boyle eventually attempting to take responsibility for his actions. No one eats turkey, and everyone accepts that, for sitcom reasons. The Holt/Pimento plot, however, is the closest thing the episode has to outside the box, even when it gets to the bookie part (which it quickly subverts, thanks to it being the 21st century). It’s a plot that starts with the emotional beat—Holt lending Pimento $2,000 for a private investigator’s license—immediately setting itself up to go off the rails and not just because Pimento is one-half of the equation. The added Thanksgiving dog show part of the plot is one of those weirder, specifically Brooklyn Nine-Nine aspects that makes up for the rest of the episode (just like Rosa admiring Boyle’s ax or font rankings), and it brings a different dynamic to the forefront. Sure, there is no emotional lesson learned, but the bonding still manages to exist. It’s absolutely ridiculous, in the best way possible. And it ends with Captain Holt doing a high-pitched dog bark with Adrian Pimento. Now that’s something to be thankful for. “Mr. Santiago” is a perfectly fine episode of Brooklyn Nine-Nine, but as a show that’s made a habit of being a lot more than “perfectly fine,” that’s not too special. 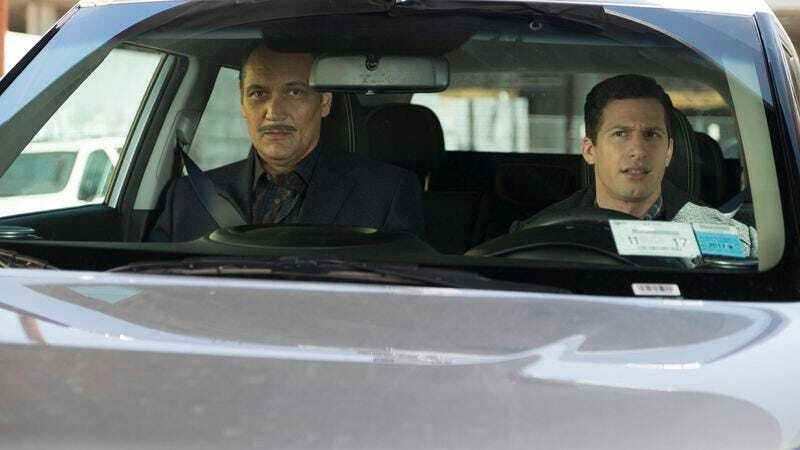 It’s not an unpleasant episode, as watching the crew of the Nine-Nine go through predictable, typical plots is still more entertaining than… well, the same predictable, typical plots on a much lesser sitcom. Even watching the crew run away from a turkey, Scooby-Doo style. This week in webisodes Brooklyn Nine-Nine needs: A Dexter credits remake, starring Boyle. This is obvious. Boyle: “I feel like Dexter. I think. I never actually saw the show. Billboard gave me nightmares.” Words cannot describe how happy I am that Boyle makes a Dexter joke in this episode featuring Jimmy Smits, instead of, you know, an NYPD Blue or even Sons Of Anarchy reference. I actually planned to mention Dexter even before seeing the episode, simply because I’m weird and feel a need to mention Dexter whenever he’s around. Terry’s muscles are “just for show.” I knew it. Jake: “That’s right. We arrested a woman today, because we are feminists.” Yeah! It’s 2016. Women can be criminals now.